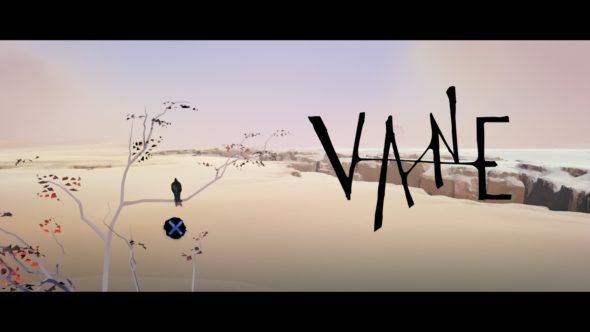 Vane is an Adventure game, developed and published by Tokyo-based Friend & Foe Games. This unique and mysterious game was released the 15th of January and is available on PlayStation 4. 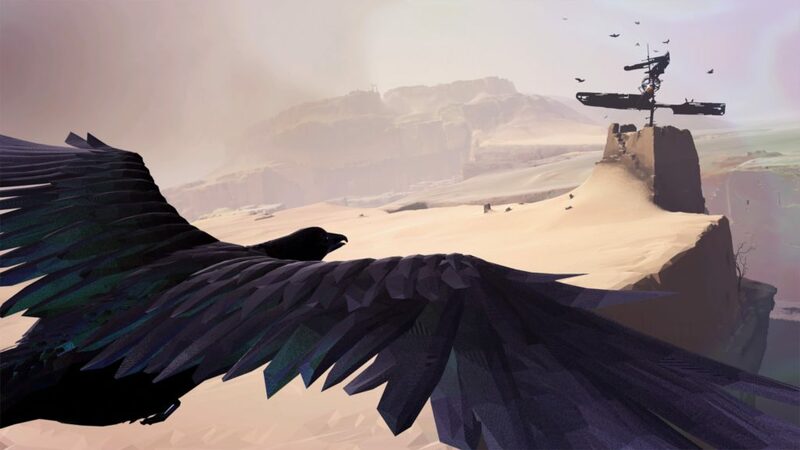 Get ready to journey through a vast desolate desert and giant eerie caves and discover the mysterious world of Vane, while you transform yourself from boy, not to man, but to a beautiful black raven. The game starts off apocalyptic. You play as a boy, holding a glowing orb in your arms, as you make your way through a destructive thunderstorm. The area consists of sand and metal, the vibe is gloomy and dark and the world seems to be coming to an end. As you reach your destination, you stumble upon a house, with only a silhouet of a giant dark mysterious figure in the doorway. The figure quickly pushes you back, the door closes and you are left lying on the ground. The screen fades to black and slowly uncovers the main title. Unlike in the prologue, the new setting depicts a vast and empty desert, with only a black raven sitting on a dead branch. You soon discover that you are now playing as the black raven and with it, your adventure starts, as you uncover the mysteries of the world of Vane. At first, the story isn’t clear at all, but that’s a good thing, it adds to the mysterious vibe of the game, but the more you discover and progress through the game, the story still retains that sense of mystery and even at the very end, you’re left scratching your head and thinking what the whole story was actually about and unfortunately, you may just leave it at that. The graphics in Vane are simplistic and lack detail, but that isn’t necessarily a bad thing. The environment is highly artistic and although the world in Vane feels very empty, it fits the mood of the game perfectly. The game’s environments will sometimes mysteriously distort, shake and change shape around you, adding to the mystery and the suspense. The use of lighting in the apocalyptic prologue, as well as in the main game, works perfectly, and not only adds to the visual experience, but is also used to mark where you need to go. Color is also often used as a marking, because in the sandy world of Vane, a lush green oasis or a pile of bright yellow leaves really stands out in the otherwise desolate wasteland. A good portion of the game has you exploring giant caves, and it is here where light and color really play a crucial role for exploring. Unfortunately, the level design feels very unfocused and extremely frustrating to explore. What good are stunning visuals if they lack any depth, or even worse, start glitching on you once and a while. The game starts off booming, with an ominous electronic soundtrack that adds to the suspense of the obliteration that is depicted on screen. When airborne as the black raven, there is no music, but only the sound of the wind rushing by as you explore the desert skies. The biggest portion of the game’s sound is a subtle ambient electronic score, with only the sound of birds in the distance to accompany you. The game definitely sets a suitable atmosphere for exploring the large empty spaces. Just like the visuals, lighting and color, guide you to your objective in the game, sound also plays a determinative role for finding your way. Vane is an Adventure game and unfortunately, your adventure only takes a couple of hours to come to a close. The game is not only short-lived, but the gameplay doesn’t live up to the stunning visuals and great soundtrack. The game is divided in two play-styles, as you shape-shift between bird and boy. In some sections of the game, you will play as the black raven, flying around in the deserted wasteland, reaching places otherwise unreachable. You can land on structures and call other nearby birds with your bird-call, which makes them come sit by you. The weight of all the birds, somehow, can topple metal structures and thus you can make way for your alter ego to reach new areas. You will come across what seems to be a pile of bright yellow leaves. When landing in these leaves, a transformation takes place and out comes the young boy. Although flying with the raven is initially very cool and unique, the camera angles and controls are clunky, and it becomes quite tedious after a while. Other sections of the game, you will play as the boy, climbing and scaling half-destroyed structures, built high-up in giant open caves, and make your way to places and performing actions unable to do as the raven. You can interact with objects, and so, solve puzzles to progress the game. Just like the bird, the boy can also call out, but this time it’s not the birds that come help you solve a puzzle, but other people, seemingly hiding in the caves. The game starts without a tutorial and it refuses to hold your hand throughout the game, and although this can be favorable from time to time, here you often feel lost and frustrated. You never have a sense of purpose and you’re often wasting a lot of time wondering what you’re supposed to do and where to go. This feeling, of being lost, adds to the general atmosphere of emptiness the game is going for, but it comes at a huge price, being the limited gameplay and overall enjoyment of the game. 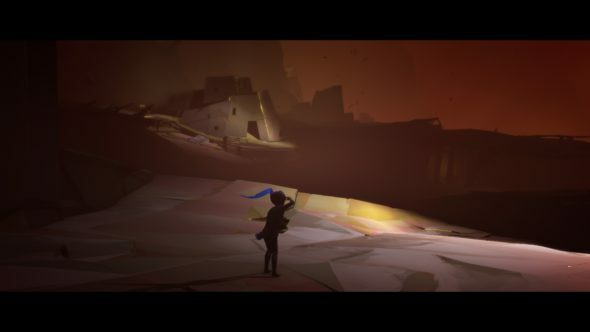 Vane is beautifully crafted game. The visuals are simple, but stunning and the soundtrack fits the game perfectly. Where the developers nailed the visuals, music and the overall mysterious atmosphere, they lost it at gameplay. With only being two to three hours long, with limited gameplay mechanics, the game feels ironically shallow, lackluster and ultimately not the most enjoyable experience. Lacking any sense of direction whatsoever is the game’s major downside. What is a feast for the senses, is unfortunately a pain to actually play through. Ultimately, Vane offers an extremely interesting and promising concept, but leaves us with a very limited experience. At the price it is going for at this moment, it is not worth picking up.